Service is a hallmark of the Schudi Organ Company, both for organs of our own and other manufacture. 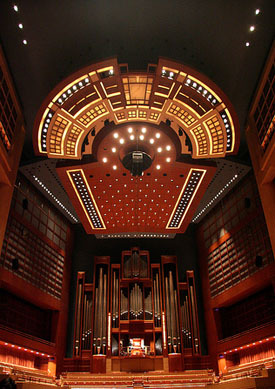 Among an ever expanding service schedule for the Schudi company is the inclusion of the highly visible Fisk organ, Opus 100 located in the Meyerson Symphony Center in downtown Dallas. We serviced the Meyerson for 22 years. Schudi was the deliberate choice of the Fisk organization for maintaining one of their most notable instruments. We honor this commitment and those to all of our service customers with the same consistent dedication. We invite your inquiries about servicing needs. It's possible that we already travel relatively close to your locale and could arrange a multiple tuning and repair situation that would include several churches in the same area. This would reduce the overall cost to each customer. This Schudi organ is big enough to provide the full sound desired by many churches, versatile enough for the performance of a wide variety of organ literature, yet economical enough for a modest budget.